Address : 48 Ipsilantou str. BOUDARI HOTEL Are offering you a great variety of services so that you can relax and enjoy the famous Greek hospitality and all the beauties of Paros. 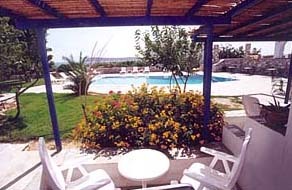 You can swim at our swimming pool, relax at our gardens full of flowers and enjoy the famous greek hospitality. Enjoy your vacations at Boudari Hotel Bungalows Studios located, in the south of Paros on the sandy beach Boudari, (which is in the front) and 150m. 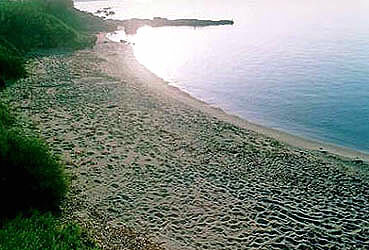 from the Golden Beach ideal for water sports. 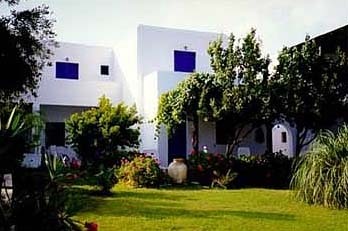 All Rooms and Suites with view to the sea. Car rentals can be arranged by the Hotel. Delivery of the car at the airport or the port the day of the customers arrival with no extra cost. 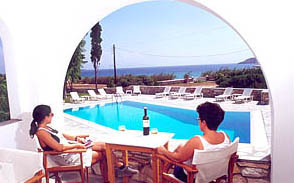 Day trips to neighbouring islands can be arranged by the Hotel (to Delos - Mykonos - Santorini). 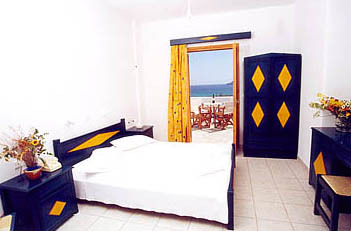 Rates are quoted in Euro, per day, per room and include all taxes. All types of accommodation include buffet breakfast (obligatory), private bathroom, safe box, TV set, fridge, music, Air-condition, heating, direct dial phone and veranda with sea view. Baby cot 6 Euro per day. Accommodations with Kitchen facilities are equipped with basic utensils and include also buffet breakfast. For any cancellations between 15 and 8 days prior to check in you may be charged the 50% of the total amount of the confirmed reservation. For any cancellations within 7 days prior to arrival and in case of no show or early departure you may be charged up to the total amount of the confirmed reservation.